This is my latest addition to our chore process at our house. I made this back in August, so we have been using it for almost four months now. It has been, and still is, very effective. I love the addition it has made to the home. 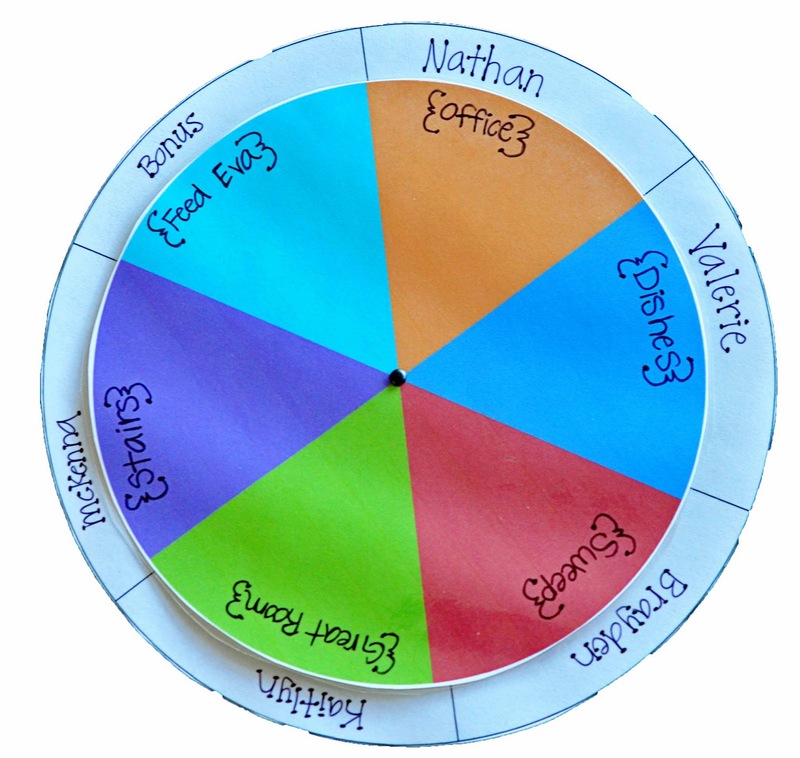 We use this chore wheel for a certain chore a family member is in charge of for one week. We do these chores right around dinner time. Some might be before dinner, some might be after. Our kitchen/formal living room area was often times cluttered with random things from family members. I made this wheel for everyone to have a contribution to keeping the area clean. I knew that once they started contributing to keeping it clean, they would be more conscious of the mess they were making. Let’s break this down some. We chose to do each chore for one week at a time. The reason for this is so that if one person slacked on their chore one day, the next person wouldn’t be doing double duty the next. You have your chore for one week, and before we switch, you make sure your chore is caught up. So if you were on dishes, you make sure that all dishes are done before passing the job on to the next person. One week is long enough to have time to learn how to do a chore without getting totally sick of it. Our first round of chores was as you see. Office, dishes, sweep, great room, stairs, and feed the pet. Our second round of chores was set table, dishes, clear table, great room, help make dinner, and feed the pet. Most of these chores are things most of the children need help with. Several of the chores are simply to pick up items that don’t belong there and put those items away. I think sweeping, setting table, clearing table, and feeding the pet are all pretty self-explanatory. For dishes, we have the child help put away what he or she can. For McKenna, that is basically silverware and a few things down low. Then the child helps load the dishwasher. All three of the kids love being on this chore. For dinner, I let the child choose the menu for the week, then we make our grocery list. Then each night, we decide what to make from our planned menu and the child helps me make it. You might have noticed we have a bonus chore each week. It was easier for me to make the pie wheel with 6 slots than with 5, so one was assigned as bonus. If you do your chore, you can then do the bonus chore and get a special surprise. It might be a treat, a high five…anything small. We did our first chore wheel rotation for 12 weeks before we were bored with it and needed to change some chores. Create a pie chart in Microsoft Word. Create a circle shape that is slightly smaller than the pie wheel. Put this shape on top of the pie wheel you made. This creates the bottom circle where you put names. Create another pie wheel that is the same size as your circle. Use a fine-point permanent marker to write names and chores. Names go on the large pie, chores go on the small pie. When it is time to change the chores, you can use finger nail polish remover and a cotton ball to remove the marker (thank you to reader Robyn for suggesting this to me on the Emergency Preparedness Binder post! I never would have thought of it). Use a pin (tack, safety pin, straight pin, etc.) to poke a hole in the center of each circle. Place the small circle on top of the large circle. Use as brad to fasten them together. I have added a file to my Google documents: Chore Wheel Gray-scale version and Chore Wheel Color (this is like mine). This is a great tool to have in the chore toolbox. Let me know if you have any questions! I love it. Not sure if my 5-year-old would go for it, though, because he has been in charge of setting the table for a while and gets upset if someone does it for him (if he falls asleep for a late nap or is finishing homework or something else happens). Maybe he should be encouraged to be more flexible, I don't know. You ladies are welcome! Kristy, you could always just leave setting the table off your chore wheel.